Entering Soviet service in 1984 in both Frontal Aviation and Troops of Air Defence units, the Su-27 Flanker was the product of the Soviet Union’s programme to develop a new fourth-generation tactical fighter force. With development commencing in the 1970’s the Flanker was to become the “heavy” fighter in a new light/heavy mix alongside the MiG-29 Fulcrum. This, of course, draws parallels to the US F-15 Eagle/F-16 Fighting Falcon hi-lo mix that also dates from the early 1970s. Unlike its Western equivalent, the Eagle, which has proven too expensive for most, the Flanker has been a winner in the export stakes for Russia. As recently as this month Venezuela signed a contract for advanced Su-30 variants, adding to a long list of recipients of the type. A quick scan of Chapter 9 indicates that at least 13 other countries count the Flanker in their inventories, not a bad record and one that inspires many interesting models. Volume 42 of the Specialty Press Warbird Tech Series sees Yefim Gordon again working with Peter Davison to produce a useful reference work on the type. Having Gordon, who is a regular contributor to the Red Star Series and Aerofax imprints of Midland Counties, as one of the authors, it comes as no surprise to find the chapters broken down in a similar way to these series. 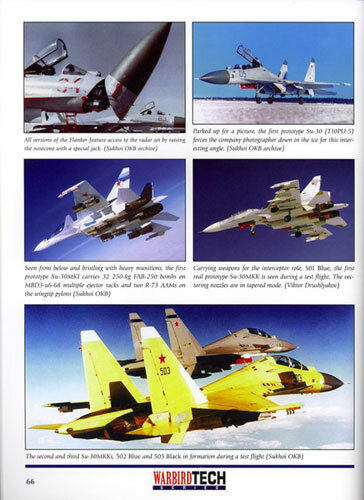 Chapters on genesis, design, development and variants form the first half, whilst ones on the Su-27K (Su-33) Naval Flanker, service history and exports form a substantial bulk of the volume. As always Gordon includes contemporary photographs of the type in service and often comments on the camouflage and markings development of the respective users. Amongst the final chapters are a detailed description of the operational Flanker in comparison with its Western contemporary the F-15 Eagle, a detailed examination of the airframe with many close-up photos and a look at the many foreign users of the type. The Flanker has proven to be a very versatile design, developing from long range interceptor to true multi-role platform and Gordon addresses in this volume the many branches in the family tree, something both modellers and enthusiasts will find useful. 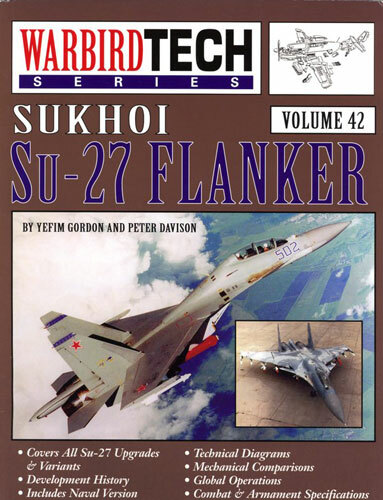 Concluding the book is a short appendix which addresses modelling the Su-27, which is of direct interest to those who will use the book as a reference for a scale replica. Richard Marmo looks at Flanker models from Trumpeter’s 1/32 effort through Italeri’s 1/72 kits to the small 1/350 Flanker D released by Trumpeter in conjunction with their Admiral Kuznetzov kit.